An ATLauncher modpack is a collection of Minecraft community modifications (Mods) used to extend the look and feel of vanilla Minecraft. If you’re new to Modpacks and ATLauncher you’ll need to install this Launcher first. 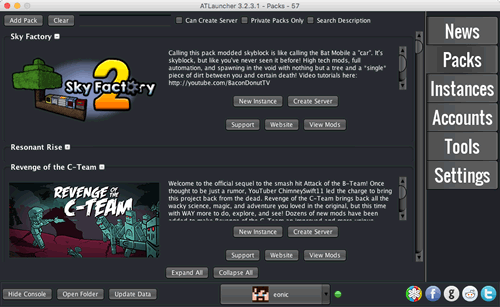 A launcher is what Installs, updates, and plays modpacks on your computer or a multiplayer server. In 4 easy steps install, launch & connect to your ATL server. Hint : The number one reason for connection problems is when the modpack’s server and launcher versions don’t match, make sure the version number in the server list matches the one on the launcher. If not change the launcher version or contact support for a free server upgrade. Make sure the modpack version in the launcher and server match, if they don’t match you’ll have a connection error when you join.